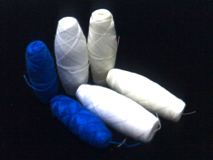 Our 100% spun polyester yarn for sewing thread, we can do both raw white (HL) and optical white (OT) which mainly of our production lines are produce yarn specification from Ne 8, Ne 15, Ne 20, Ne 30, Ne 40, Ne 50, Ne 60 and Ne 80 both two plies and three plies. Our Poly/Poly core spun was made from High Tenacity Polyester Filament covered with polyester sheath during spinning process. We produced Raw white (PT) and Optical white (PO) Ne 16, Ne 21, Ne 39, Ne 36, Ne 45 and Ne 59 both two plies and three plies. Our Poly/Cotton core spun (CP) was made from High Tenacity Polyester Filament covered with cotton sheath during spinning process. Our production lines are produced yarn specification from Ne 16, Ne 21, Ne 36, Ne 45, Ne 59 both two plies and three plies. Our newest product is made from type of continuous filament thread (Polyester) produced by converted the flat filament yarns to yarn in one step which look similar to spun yarns. At the first stage, our production lines are produced in TEX 40 ,TEX 60 and TEX 90. Our Finished yarn products, we used both Spun & Core-Spun (Poly-Poly) to make them. Mostly we have Natural & Black color with the packages length of 6,000 - 12,000 yards, On Kingspool and Plastic (3 Degree, 4 - 6 inches) cone. For lubricant process we have both Silicone and Mineral oiling. Back Yarn Bobbin or Lockstitch Quilting Thread, which the main application for sewing bedding and mattresses. 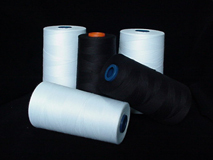 We have 3 types, 100% Spun Polyester, Core Spun Polyester (Poly-Poly) and 100% Polyester Filament. Used for shuttle #7 and #10.